We believe that there is one God, eternally existent in three persons: Father, Son, and Holy Spirit (Gen 1:1, John 10:30, 37-38). We believe in the deity of our Lord Jesus Christ, His incarnation and virgin birth, His sinless life, His vicarious and atoning death through His shed blood, His bodily resurrection, His ascension to the right hand of the Father, and His personal return in power and glory (Matt. 1:23, Luke 1:35, John 1:14, 11:25, Acts 1:11, Col. 1:14, Heb. 4:15, 7:25). We believe that for the salvation of lost and sinful man, regeneration by the Holy Spirit is essential (John 3:16-19, 5:24, Rom. 3:23, Eph. 2:8-10, Titus 3:5-6). We believe in the present ministry of the Holy Spirit, by whose indwelling the Christian is enabled to live a godly life (1 Cor. 3:16, 6:19-20, Gal. 5:22-23, Eph. 4:30, 5:18). We believe in the resurrection of both the saved and the lost; those who are saved unto the resurrection of life, and those who are lost unto the resurrection of damnation (John 5:28-29). We believe the Bible to be the inspired, authoritative word of God, infallible in its original form (2 Tim. 3:16, 2 Peter 1:21). We believe in the creation of man by the direct act of God (Gen. 1:26-28). We believe that God created man as male and female and ordained marriage as the covenantal commitment between a man and a woman (Gen. 2:24, Eph. 5:22-33). We believe that the Bible teaches that no intimate sexual activity be engaged in outside of the marriage commitment between a man and a woman (Gen. 2:24, 26:8-9, Lev. 18:1-30, Rom. 1:26-29, 1 Cor. 5:1, 6:9, 1 Thess. 4:1-8, Heb. 13:4). 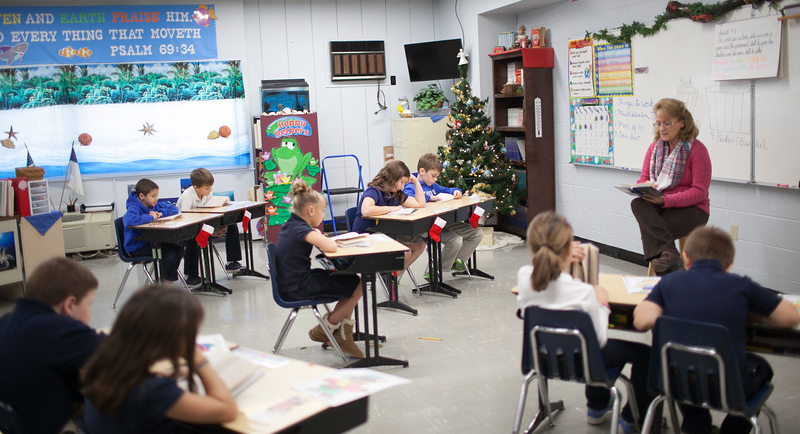 Heritage Academy’s mission is to provide a Christian education, offering the highest quality of academics taught from a Biblical perspective that will equip all students academically, spiritually, socially, and physically so that they may discern and live out God’s plan for their lives as Christian leaders.